Day 2 was a day of connecting and re-connecting. 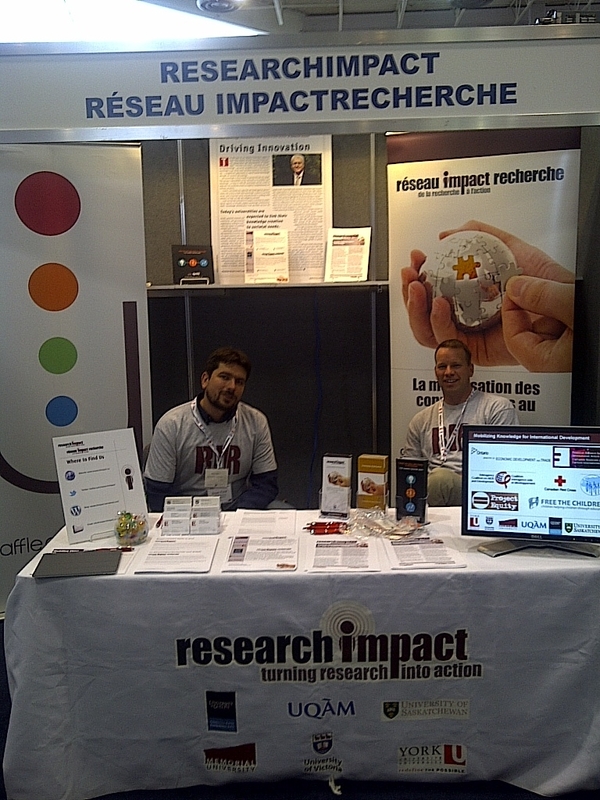 We first welcomed Bojan Fürst to the ResearchImpact-RéseauImpactRecherche booth at Congress. In 2011, Bojan joined the Harris Centre at Memorial University of Newfoundland and Labrador as manager of Knowledge Mobilization. You can read more about Bojan in the Harris Centre’s newsletter The Regional. In Bojan’s words, “As a manager of knowledge mobilization my job is to connect the needs of Newfoundland and Labrador communities and regions with the expertise that resides at Memorial. I am essentially a matchmaker and my tool of trade is our opportunity, research and expertise online database yaffle.ca. Yaffle is a true repository of ingenuity in this province. It is an essential component of a network of economic development practitioners, policy makers, experts, students and community champions. Yaffle would not be what it is without its users, so I do encourage all of you to register an account, and make it stronger with your own expertise and innovative ideas added to our collective knowledge.” Yaffle has been featured in a number of stories in Mobilize This! and we are pleased and proud to have a Yaffle banner and a Yaffle expert in the RIR booth. Welcome Bojan, who fits right in not just as a knowledge broker but as someone who is always laughing and enjoying life. Reconnecting with colleagues is always a joy of Congress. SSHRC, Canadian Federation of Humanities and Social Sciences, Centre for Community Based Research… all great colleagues who are great to reconnect to and are great knowledge mobilization colleagues you need to know to help connect your research with non-academic partners. Don’t forget to save the dates of June 12-15, 2013, in Corner Brook Newfoundland for the next Community-University Expo.